With Physician Quality Reporting Initiative (PQRI) initiatives gaining traction and meaningful use rules looming, the ability to mine a facility’s data for useful information is becoming more pronounced. 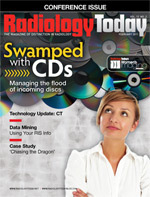 In radiology, data-mining tools offer the advantage of drawing conclusions based on your own facility’s activity. Kim, a creator of the Yottalook search engine, says Google-type searches were a good first step, but their usefulness has limitations. There’s no question that Google has changed the way people analyze data but if you’re a radiologist searching a database of reports for decision support, Google is the technological equivalent of the person at a cocktail party who shares too much: The interaction can be a chore, and there’s a pretty good chance that anything interesting will be buried by the information avalanche. Kim says adding intelligence to the search can significantly improve the ability to find information within radiology reports and metadata associated with the reports, such as who ordered a report, who wrote it, and how long it took to generate the report. “Being able to search radiology reports provides clinical decision support at the time of study interpretation,” says Kim. To meet this need, Kim and colleagues at the University of Pennsylvania created the Pathology-Radiology Enterprise Search Tool (PRESTO). The Penn researchers wanted to meet Clinical Decision Support, Operational Analyses & QA, Research and Education (CORE) requirements, but with a database containing more than 900,000 radiology reports, filtering data was a necessity. PRESTO looks like a Google search engine, but it mines the RIS and the pathology database using logic algorithms to produce positive matches to queries. During its first month of operation, PRESTO was used for more than 60,000 searches. Because of interest from other institutions and imaging centers, PRESTO has been commercialized by Montage Healthcare Solutions, Inc under the name Montage. The Montage system is designed to work with various vendors’ RIS. Massachusetts General Hospital has also been heavily involved in data mining. Using a process it developed called natural language processing, the Lexicon Mediated Entropy Reduction (LEXIMER) system has been used to mine Mass General’s RIS, PACS, and decision-support data for the past 15 years. As with Montage, consumer interest led Mass General to license LEXIMER to Nuance. Keith J. Dreyer, DO, vice chairman of radiology at Massachusetts General Hospital and a creator of LEXIMER, says the system has allowed Mass General’s radiologists to identify disparities between ordering physicians related to the use of high-cost medical imaging, the overuse of recommendations by radiologists, improvements in decision-support rules and logic, correlations between clinical indications and disease states identified on imaging examinations, and more. It has also allowed for experimentation with a new method of decision support at the time of interpretation that is guided by aggregated findings from patients with similar demographics and clinical indications. These developments have allowed radiologists to look at their data in new ways. “Now you can go into the data and let the data create inferences amongst itself and then tell me what it found that are trends that are interesting and relevant that might allow me to create a new hypothesis that I myself wouldn’t have been able to come up with because I don’t have all the data in my head,” says Dreyer. Kim and Dreyer agree that data mining will grow in importance, one reason for this being the PQRI. There are already initiatives in place for fluoroscopy use, emergency CT and MRI use, stroke outcomes, and outcomes for vascular conditions related to the carotid artery. With the aid of data mining, medical facilities will have an easier time demonstrating that they’re meeting the PQRI targets. Kim says although the PQRI has taken small steps so far, the pace of and emphasis on these initiatives is likely to increase. Dreyer adds that the growing interest in accountable care organizations, which would require facilities to improve outcomes and justify their expenditures, will make data mining even more important. He says facilities will need to understand where their money is going as well as how to manage particular disease states. Measuring outcomes is also among the goals of meaningful use rules, which will become increasingly prominent in medical facilities in the years ahead. Data mining is done in many facilities today, but Kim says many are looking to do more. He cites an abundance of digital data, affordable computing power, competitive pressures, decreasing reimbursement, and an increasing focus on quality improvement as significant drivers of this phenomenon. But even with the increased interest, he believes more can and should be done. Other industries, such as finance, are more sophisticated in their approach to data mining, and Kim believes the medical field needs to learn and catch up. He believes institutions must move beyond mining retrospective data and start looking at areas such as knowledge discovery and predictive analytics. To do that, Kim says facilities must make sure they, not their vendors, own their data. And he says any data-mining initiative requires a multidisciplinary effort between the radiology and the IT departments. But while facilities once had to develop their own tools if they wanted to dig deep into their database, which excluded all but the largest and best-funded facilities, commercial tools now make it possible for many more facilities to benefit from data mining.